Rare objects or is Big Bang model inaccurate? News Flash: (June 12, 2012) This article was just nominated as one of the best science blog articles of the past year at 3-Quarks Daily. In voting it just missed getting in the top 20 of the 107 articles nominated; proving more popular than several Scientific American articles. The European Southern Observatory (ESO) recently reported a surprise while observing two extremely distant galaxies; at a very high redshift (z = 3.57); so far away that they are seen as they were a long time ago: only 1.8 billion years after Big Bang. The surprise was to discover that the cool gas in these presumably young galaxies was very rich in heavy elements (all called metals), a chemical composition usually only seen in older galaxies because it takes so long to make heavy elements. The problem with this interpretation is that the metallicity is almost ten times higher than the metallicity of objects measured at the same redshift. The ESO report claims that this is “something unthinkable until recently,” but provides no explanation why we should accept the conclusion that these galaxies have a high rate of star formation! The preprint suggests that “what happens at higher redshift is not totally understood,” and “the situation might be different in the nearby Universe,” but still accepts that the observed galaxies are only 1.8 billion years old. Certainly, these two galaxies haven’t been merging for their entire life. It is difficult to understand how such a high density of heavy elements could have been formed in such a short time. Of course, if the universe is much older than the Big Bang model accounts for, then these galaxies form new stars at the same rate as all other galaxies. The interpretation of the cosmological redshift as a Doppler shift forces cosmologists to assign a limit to the age of the universe. But if the redshift is produced by a “tired light” mechanism then the universe can be much older than 13.7 billion years and the metallicity content of all galaxies can be similar. Not only do the new results point to a weakness of the Big Bang model, they support non-conventional redshift mechanism. 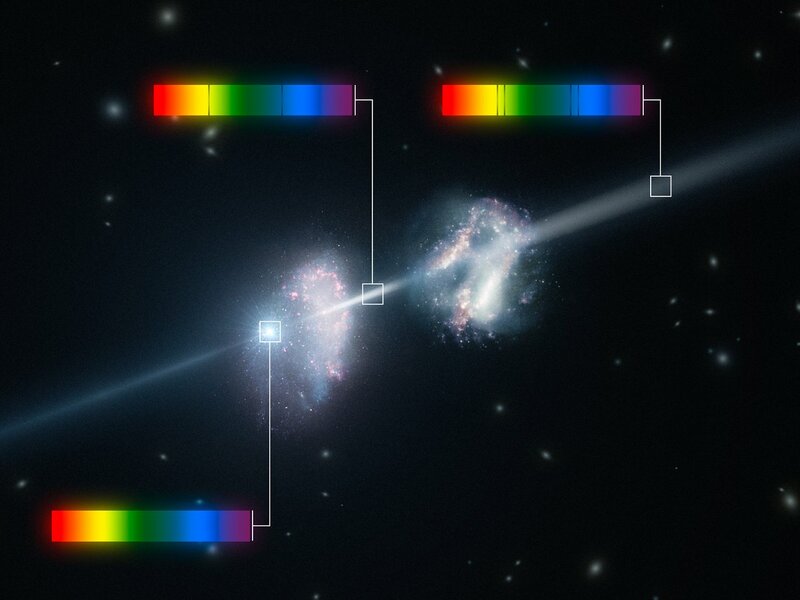 The two galaxies G0 and G1 made visible by GRB 090323 have heavy elements because they are much older than 1.8 billion years! This entry was posted in Basic Astrophysics, Big Bang Models, Experiments, Static Models, Structure, Universe Age and tagged 090323, Big Bang, Big Bang Age, extremely distant galaxies, gamma ray bursts, GRB, metallicity, Scientific American, young galaxies. Bookmark the permalink. 4 Responses to Observation of two early yet mature galaxies: Rare objects or is Big Bang model inaccurate? The fundamental laws of optics are too often ignored in astrophysics. It is good that errors are shown. This is fascinating. What does it mean to the Big Bang model if the redshift is not due to expansion, but to optical cooling? Is the universe not in fact expanding after all? The distance of a galaxy could still be inferred from its redshift, but the existing inferred ages would be all out to lunch? A quantum leap in cosmological modeling. the implications of a redshift caused by an optical effect have been studied and are staggering! The inferred cosmological distances would still be correct. However, as you say, the inferred ages of the galaxies and the age of the universe would have to be revised up, way up. The principal ideas brought by “laser cooling theory” are that the universe is transparent (no absorption of light) yet interacts with light (redshift). The redshift derives from thermodynamics: hot radiation is cooled to the low temperature of the universe. A “tired light” mechanism (as it was called by Zwicky in 1929) immediately brings down two of the four pillars of the Big Bang theory: 1-“the expansion of space” and 2-the “cosmic microwave background radiation” which is light in thermodynamic equilibrium (an equilibrium which is reached over a much longer time than 14 billion years). Then, the other two pillars fall like dominoes: The “abundance of primordial elements” is likely a result of nuclosynthesis in galactic centers, again over a time period much longer than 14 billion years. And the “galactic evolution and distribution” is likely the result of an evolution in a universe much older than 14 billion years. These last two theories have only been studied in the context of the Big Bang; there is a lot of new research to be done in the light of the new paradigm in cosmology.